On the eve of her daughter's wedding, June Reid's life is completely devastated when a shocking disaster takes the lives of her daughter, her daughter's fiancé, her ex-husband, and her boyfriend, Luke - her entire family, all gone in a moment. And June is the only survivor. From the couple running a motel on the Pacific Ocean where June eventually settles into a quiet half-life, to the wedding's caterer whose bill has been forgotten, to Luke's mother, the shattered outcast of the town - everyone touched by the tragedy is changed as truths about their near and far histories finally come to light. Elegant and heartrending, and one of the most accomplished fiction debuts of the year, Did You Ever Have a Family is an absorbing, unforgettable tale that reveals humanity at its best through forgiveness and hope. At its core is a celebration of family - the ones we are born with and the ones we create. My mom made Lolly Reid's wedding cake. She got the recipe from a Brazilian restaurant in the city where she went one night after going in with her friends to see a show. It was a coconut cake made with fresh oranges. She prepared for days. It didn't have any pillars or platforms or fancy decorations; just a big sheet cake with a scattering of those tiny, silver edible balls and a few purple orchids she had special-ordered from Edith Tobin's shop. She was proud of that cake. She bakes and decorates cakes for all the birthdays in our family, and she made the wedding cake for my sister's wedding, and mine; so when June Reid hired us to cater her daughter Lolly's wedding, I thought, Why not? After June has had an argument with her daughter, Lolly, the night before Lolly's wedding, "Pru asked if she was okay, and June answered with a question that seemed to Pru more of a comment on June's struggles with Lolly: Did you ever have a family?" (p. 131) Why do you think Clegg choose this line as the title of his novel? What does being part of a family mean to each of the characters in the novel? Do any of their perspectives change? ...the quick and episodic structure of Clegg’s novel doesn’t allow for enough development. That said, I don’t actually think Clegg intentionally neglects his characters. Rather, it seems like the emotional separation he gives us is intentional. It feels as if the overwhelming density of characters and circumstances is supposed to be a metaphor for the larger loss of life that pervades the novel, a sort of suffocation in grief. (Reviewed by Bradley Sides). Starred Review. [It's] Clegg's deft handling of all the parsed details - missed opportunities, harbored regrets, and unspoken good intentions - that make the journey toward redemption and forgiveness so memorable. Starred Review. Clegg is both delicately lyrical and emotionally direct in this masterful novel, which strives to show how people make bearable what is unbearable, offering consolation in small but meaningful gestures. Both ineffably sad and deeply inspiring, this mesmerizing novel makes for a powerful debut. Starred Review. Readers may come to this debut novel because of agent/memoirist Clegg's reputation, but they'll stay for the stellar language and storytelling. Highly recommended. Starred Review. An attempt to map how the unbearable is borne, elegantly written and bravely imagined. I marveled my way through Did You Ever Have a Family, at not just the masterful writing and storytelling, but at the emotional authenticities of every persuasion. It's a wondrous thing when a writer gets things this right, this absorbing, and this beautiful. Bravo, Bill Clegg, and thank you. Full of small-town secrets and whispers, Bill Clegg has woven a richly textured tale of loss and healing. This is a deeply optimistic book about the power of human sympathy to pull us from the wreckage of our fate. Like the question it poses, Did You Ever Have a Family is brutally direct yet it's got an enormous symbolic power...It's been a lot of years since a novel has so moved me. Number Bill Clegg among that endangered species: major American writer. The force, range, and scope of Bill Clegg's Did You Ever Have a Family will grab you with its opening lines, and won't let go until its final one. I can't recall another novel that so effortlessly weds a nuanced, lyrical voice to an unflinching vision of just how badly things can go for people. I almost passed on reading this book because of the tragedy involved in the story. So glad I didn't. This is one of the best pieces of fiction I've read in awhile. Great storytelling and really wonderful character development. I highly recommend it. Bill Clegg's Did You Ever Have A Family tells the story of different characters whose lives intersect as they deal with the struggles (and few successes) of life. One character stands out among the large cast: June Reid, a middle-aged woman, who is dealing with the loss of her entire family from a tragic fire. 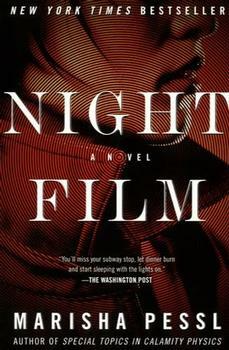 Brilliant, haunting, breathtakingly suspenseful, Night Film is a superb literary thriller by the New York Times bestselling author of the blockbuster debut Special Topics in Calamity Physics.